Is Obama's Problem With Independents Actually a Problem with the General Electorate? In the wake of last week’s ABC News/Washington Post poll, ABC News reported that Obama has a problem with independent voters. On the one hand, this isn’t surprising. Obama has consolidated the Democratic vote, and yet he remains beneath 50 percent among registered voters; obviously independents aren’t swooning to support the President’s reelection. But does that mean Obama has a problem among independents? That’s a tougher question to answer, and it turns on expectations for eventual partisan turnout, another question that has riled analysts in recent weeks. There are hints that the broad category of “independent” obscures Obama's more specific issue with white independent voters. According to Pew Research, Obama leads among independents nationally, but trails by 10 points among white independents, 40-50. Again, this isn’t necessarily a surprising conclusion: Obama is at historic lows among white voters and that entails big losses among white independents. But Obama’s issue with independents seems to extend a bit further than problems with the entire electorate. 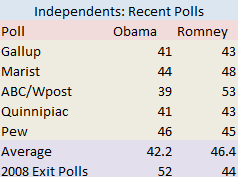 Notice that Romney seems to lead among independents even as Obama is tied or ahead in all five polls. There is also evidence that Obama’s approval ratings among independent voters are net-negative. Quinnipiac, for instance, shows Obama’s approval underwater at 40-52, even though Romney has only consolidated 43 percent of the independent vote; this suggests that Romney has an opportunity to consolidate plenty of independent voters with reservations about Obama’s performance. If Romney secured a majority of independent voters, Obama would need to compensate with a Democratic-leaning electorate. Is that realistic? Yes, to a certain extent: In the 2010 midterms, Democrats and Republicans each represented 35 percent of the electorate; in 2012, higher minority turnout will tilt that number in a Democratic direction, even if not overwhelmingly. Decent Democratic turnout could overcome a modest defeat among independents. For instance, Obama could potentially counter a 6 point deficit with independents in an electorate that leaned 3 points Democratic, but even that scenario only produces a tied election. So is it useful to say that Obama has an independent problem? A little—it helps clarify the importance of Democratic turnout to Obama’s chances. It also might help explain the behavior of one critical swing state, which I’ll explain in the next post. But Obama’s independent problem isn’t much different than his problem with the electorate as a whole.